Dubai has a reputation for being a visionary city, a pioneer that shapes its own destiny. The spirit of possible and wise foresight have been hallmarks of Dubai’s economic progress over the past decades. And what once was a tranquil town has emerged as one of the most cosmopolitan cities in the world, enabling the UAE to evolve into the record-breaking and innovative country it is today. In as little as 10 years, His Highness Shaikh Mohammad Bin Rashid Al Maktoum, Vice-President and Prime Minister of the UAE and Ruler of Dubai, has proven his theory that the UAE “is the embodiment of confronting difficulties, overcoming obstacles and conquering the impossible”. And there is no doubt that a rising city, which is home to more than 200 nationalities, needs to overcome many challenges, not least those accruing from the sheer endless cultural diversity. Satisfying the growing demand for affordable housing seems to remain the most pressing issue, despite the introduction of Federal Mortgage Caps almost two years ago and numerous project launches such as the most recent Serena and Arabella 2 developments, introduced by Dubai Properties this year. 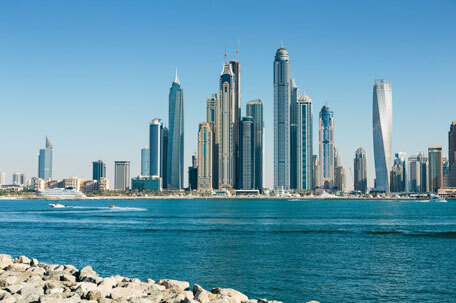 According to analysis carried out by Cluttons on the UAE Ministry of Economy’s 2008 Household Income Survey, average annual expat incomes across the country averaged less than Dh200,000. Residential rents in Dubai’s freehold areas stood at Dh181,000 — a clear disparity between incomes and the cost of living. Declining overseas allowances due to global market tumult add to the pressure on residents in the middle-income class. Single households and families with a combined income that ranges from Dh240,000 to Dh360,000 form the new segment of focus for developers across the emirate. The industry speaks with one voice when it comes to the affordable housing market. Forecasting an increasing amount of middle-income developments that will enter the market and appeal to a much wider demographic will contribute to sustaining and stabilising Dubai’s property market, helping it to continue to mature. Demand and supply are balanced according to key players in the real estate arena who attribute their confidence to latest sales bookings, improved regulations within the sector, and the overall growth of population, economy, tourism, number of visitors and infrastructure investments in the emirate. Another concrete step in stabilising Dubai’s real estate market is the rent calculator launched by RERA. Updated on an annual basis, this tool is easily accessible online for the end user, and aims to monitor and bridge the gap between market demand and reality. In light of the current global financial situation, accompanied by the fluctuating oil prices and commodities, cash management has become a crucial aspect of the overall equation. Payment terms proposed by developers have become a key focus and priority for consumers, as well as investors seeing a limited cash flow that will actually increase the return on investment with time. Planned cash management will eventually play a key role in stabilising the market, and balancing the chain of supply and demand. Dubai, through its developers, is on track to close the gap to affordable living and we’ve seen a range of accommodation models such as Al Khail Gate and Remram that are tailored to the needs of a growing middle-income class. As the city is gearing up to host the World Expo 2020, Dubai once again has the ideal opportunity to showcase itself as a pioneer in futuristic living. • Bolstering other industries such as health care, education, transportation as well as leisure and entertainment. • Sustaining small-and medium-sized enterprises that support gross domestic product and economical employment pool. • Securing financial availability for other economic activities to thrive. • Creating a differentiated market segment that balances and protects the real estate industry. • Attracting local and international demand and investments.